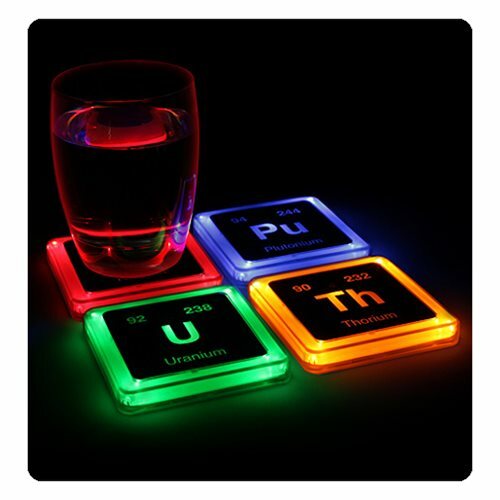 Enjoy this Radioactive Elements Glowing Coaster Set! Featuring the atomic number and isotopic mass of the most stable or common isotope for their respective radioactive elements, these pressure-sensitive coasters light up when you place your drink on them. Choose from red Radium-226, blue Plutonium-244, green Uranium-238 (Green), and orange Thorium-232. Great for a conversation starter and parties, enjoy these Radioactive Glowing Coaster Set! Coasters come packaged with a radioactive themed box and each coaster measures about 3 3/4-inches long. Each coaster require 2x "CR2032" batteries (included). Ages 13 and up.